I was the right side of sixty when I first met Zachariah. He inserted himself into my life, into my book without invitation or encouragement and seems determined to stay in spite of our questioning of him. You see he is a creature not easily deterred or discouraged. He appears to have a strong belief in his value to our project and perhaps he is right. 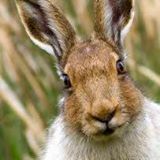 Initially I thought a hare by the name of Zachariah who could talk, claimed to see prophetic visions and to be the reincarnated soul of the biblical prophet Zacharaiah from ancient Baylonia, was a ludicrous literary device in such a serious tale of weighty matters. I cannot remember, and nor can my hero Cormac, how he came to be with us. He simply popped up one day and seemed at that time to have something to say. He is a persuasive animal with an exuberant and forceful nature. Like all hares he has a light-heartedness, a lightness of touch that is difficult to resist. He tells me that he is a useful literary tool in my tale of early religion, dark deeds and strong passions. I question him on what a hare or for that matter a Babylonian prophet from the 3rd C BC knows about the book business and he smugly reminds me that the book – co-authored by himself – outsells every other book in the English language. What can I say? “And you have saved him, Cormac. Remember when the eagle tried to seize him in the wadi?” I pointed out. Never one to be left out of a conversation the hare popped in to remind us: “Eagles are birds of great power, my friends. They fly high and can see the future coming. That eagle foretold your journey, master monk, back from the desert fathers in Egypt to the land of your birth and he will also return to guide me to your pursuer, the Bishop of Rome’s feared emissary Father Montazel.” Declared Zachariah. Cormac did not look convinced and Zachariah smiled his ancient Babylonian smile.